Random House Trade Paperbacks, 9780812982626, 480pp. How much did you know about North Korea before reading The Orphan Master’s Son? How has it changed your perspective on life there? 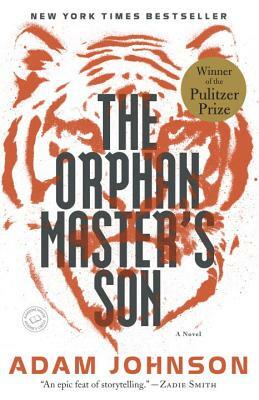 The Orphan Master’s Son has been characterized as a thriller, a love story, and a political dystopia. How would you classify the novel in terms of genre? How do you think each of these genres manifests itself in the book? Speaking of genre, Adam Johnson once categorized the novel as a “trauma narrative.” How do you interpret that term? Do you think it suitably describes the novel, and if so, in what ways? How did you feel about the inclusion of Kim Jong Il as a central character in the book? How would you say Johnson depicts him? Were you surprised by his portrayal? How do the propaganda chapters, written as if spoken from a loudspeaker, play into your reading of the novel? What do you feel the first-person narrative contributed to the story? Did you feel more or less removed from a world so closely guarded? Reviewers have drawn comparisons between The Orphan Master’s Son and classic dystopian novels such as Nineteen Eighty-Four and Brave New World. Are these apt comparisons? Does Johnson’s fiction, which is based on fact, have a different impact from that of novels which center on invented worlds? At one point, Dr. Song says to Jun Do, “Where we are from, stories are factual. If a farmer is declared a music virtuoso by the state, everyone had better start calling him maestro. And secretly, he’d be wise to start practicing the piano. For us, the story is more important than the person. If a man and his story are in conflict, it is the man who must change.” What does this mean in the context of the novel? In one of the most poignant and powerful moments in the book, one of the interrogators remembers the way in which his father explained life in North Korea: “Even if we walked this path side by side, he said, we must act alone on the outside, while on the inside, we would be holding hands.” What does the quote imply about the reality of living in such a repressive society? How does it speak to humanness in the face of inhumanity? Discuss the significance of “Jun Do” as a homonym for “John Doe,” the Western name for the unnamed and the everyman. Discuss Jun Do’s physical and emotional journey, and his transformation from the beginning of the novel to the end. One critic described The Orphan Master’s Son as “darkly comedic,” and another as, at times, “ridiculously funny.” How do you feel about the use of comedy in conjunction with the brutality of the novel? How should the rest of the world respond to the violence and tyranny of present-day North Korea? Do we have a moral obligation to intervene? What can we do to help the people of North Korea without supporting its government?